The Grand Ole Opry – what a history! The Grand Ole Opry is one of the oldest and most revered music institutions in the United States (and located within walking distance of the Willie Nelson and Friends Museum). It is kind of a countrified version of the Metropolitan Opera. This live Nashville-based radio program debuted on Saturday, November 28, 1925, on brand new radio station WSM. Commercial radio itself had started only five years earlier. The show was originally called The WSM Barn Dance, and the first performer heard on the show was a 77-year-old fiddler known as Uncle Jimmy Thompson. Over the next several decades, the Opry would help expose a wide range of other musical talent to the public, including such country megastars as Bill Monroe, Roy Acuff, Ernest Tubb, Hank Williams, Patsy Cline, Johnny Cash, Loretta Lynn, Reba McEntire, Clint Black, Marty Stuart, Brad Paisley, and Carrie Underwood. A youthful, short-haired, clean-shaven Willie Nelson made his Opry debut in 1964. (Take a look at the photo of his Grand Ole Opry debut) That association ended when Willie, disillusioned with the Nashville music establishment, moved back to Texas in the early 1970s. Now well into the 21st century, the Opry continues to offer an entertaining mix of legendary country veterans and hot new singing sensations. Each year, hundreds of thousands of people visit the Grand Ole Opry House in Nashville to see the live show. WSM and the Opry played major roles in establishing the mainstream popularity of country music throughout the United States, as well as in turning Nashville into “Music City USA.” And the history of the Opry is a window to the history of country music itself. A month after WSM went on the air, George D. “Judge” Hay was hired as the station’s program director. Hay had previously established the WLS Barn Dance in Chicago. Hay refashioned his idea from Chicago as the one-hour-long WSM Barn Dance in 1925. The Opry’s first home was the top, fifth floor of the National Life and Accident Insurance Company headquarters, on 7th Avenue in downtown Nashville. In the ‘20s, the WSM Barn Dance/Grand Ole Opry featured mainly such traditional country musicians as fiddlers, banjo players, and harmonica players. Those bands—which all seem to have had colorful names—included Dr. Humphrey Bate and his Possum Hunters, the Binkley Brothers’ Dixie Clodhoppers, Ed Poplin and his Barn Dance Orchestra, the Gully Jumpers, and Uncle Dave Macon and his Fruit Jar Drinkers. The latter group was reportedly Hay’s favorite because of its “red hot fiddle playing.” Uncle Dave Macon was the first major star of the Opry. The banjo player had a successful recording and vaudeville career in addition to his Opry performances. A 1927 recording by Uncle Dave Macon and his Fruit Jar Drinkers. In 1928, WSM acquired the “clear channel” frequency of 650 kilohertz (AM 650), which it retains today. In 1932, the station obtained a 50,000-watt transmitter and an 878-foot antenna tower in Brentwood, just south of Nashville. The tower was the tallest antenna in North America at the time, and it is still used today. These major upgrades vastly increased the broadcast reach of the station—and of the Opry. On atmospherically favorable nights, the WSM broadcast signal became capable of being heard in about 30 states. After Opry crowds became too large for the National Life office building to handle, the company constructed a 500-seat auditorium for the show—the Hillsboro Theatre (now known as the Belcourt Theatre). This was the Opry’s home from 1934 to 1936. 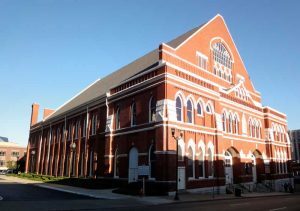 When that also became too small to handle Opry fans, the show was moved to the 3,500-seat Dixie Tabernacle, where it stayed from 1936 to 1939. The lack of dressing rooms and other inadequate conditions in that religious revival house necessitated another move, to the War Memorial Auditorium, where the Opry stayed from 1939 to 1943. The Opry began to charge an admissions fee, of 25 cents, while it was based in the War Memorial Auditorium. The ‘30s saw the Opry transition from an old-timey instrumental show to a contemporary country-singer show. Roy Acuff and Bill Monroe—who would remain Opry figures for decades—first joined the cast during this period. Other artists included the Delmore Brothers, Pee Wee King, Curly Fox and Texas Ruby, Asher and Little Jimmie Sizemore, and Zeke Clements and the Bronco Busters. The Opry also began to add comedy to its lineup in the ‘30s, with such acts as Sarie and Sallie, and Jamup and Honey. New Opry members are invited to join the cast by the Opry’s management. Little Jimmie Sizemore and his father, Asher, perform “My Tennessee Rose” in the 1930s. The Ryman Auditorium in downtown Nashville, TN. The Opry’s most famous home—considered a sacred place by fans of traditional country music—was the Ryman Auditorium, which hosted the show from June 1943 to March 1974. The beginning of the Ryman period coincided with the increased exposure of the Opry’s radio broadcast. The radio broadcast, which had previously reached primarily regional audiences, began to be heard nationally in 1939 when the segment known as The Prince Albert Show became syndicated on more than 140 NBC stations. This national reach contributed immensely to the increased national popularity of country music during the 1940s and 1950s. Ernest Tubb made a further breakthrough by leading a group of Opry performers in a concert at Carnegie Hall in New York City in September 1947. Tubb also led Opry shows to Europe. And he began airing his own post-Opry show, called The Midnite Jamboree, from his downtown Nashville record shop in 1947. Some of the Opry’s best known performers during this period were Tubb, Red Foley, Eddy Arnold, Little Jimmy Dickens, Whitey Ford, Cowboy Copas, and the Willis Brothers. Famous comedy-oriented acts that debuted at this time included Minnie Pearl, Grandpa Jones, and David “Stringbean” Akeman. In one of the most legendary stories in the history of country music, Hank Williams made his Opry debut on June 11, 1949. He sang “Lovesick Blues” in such an electrifying manner that the audience called for six encores. Hank Williams singing “Lovesick Blues” at the Opry in 1949—though this is a different night than that of his June 11 debut. The ‘50s were when the Nashville recording industry became a really big business in “Music City USA.” Record sales driven by airplay on radio stations throughout the country were more important than ever before. New Opry membership became based primarily on hit country records. Numerous future country legends first performed on the Opry during the ‘50s. These included Kitty Wells, Ferlin Husky, Hank Snow, Webb Pierce, Porter Wagoner, Faron Young, Skeeter Davis, George Jones, Johnny Cash, Ray Price, Jim Reeves, Marty Robbins, Carl Smith, and Chet Atkins. Also during the ‘50s, the Opry—as well as the country-music industry as a whole—struggled with finding its reaction to rock’n’roll. The drums and prominent electric guitars—not to mention the overt sexuality—of rock’n’roll and rockabilly were generally rejected by the conservative Opry establishment. However, certain milder forms of rock were allowed, such as the Everly Brothers. And previously, a few artists, such as Bob Wills in 1944, had ignored the Opry’s ban on drums. Ernest Tubb in the ‘40s had been the first Opry act to feature an electric lead guitarist. Elvis Presley, at the very start of his career, sang on the Opry stage one night only, on October 2, 1954. He was never invited back after his unconventional, high-energy, hip-shaking performance of “Blue Moon of Kentucky,” which elicited a lukewarm, confused reaction from the audience. After the performance, Opry manager Jim Denny reportedly told Presley to go back to truck driving. By contrast, Presley was welcomed enthusiastically by the Opry’s main competitor, the Louisiana Hayride on KWKH. Elvis receiving an enthusiastic reaction to his version of “Blue Moon of Kentucky” at the Louisiana Hayride in October 1954—a couple weeks after he bombed at the Opry with the same song. Over subsequent decades, the Opry management’s cautious attitudes toward instrumentation and rock-tinged music were gradually forced to become more liberal—mainly out of economic necessity. As the rest of the nation was enjoying pounding drums, blistering electric guitar solos, and hard-driving music, the Opry eventually realized that it would have to allow these elements on to its stage to remain a viable enterprise. The addition of future Hall of Famers and other country greats to the Opry continued in the 1960s. These included Patsy Cline, Hank Locklin, George Hamilton IV, Billy Walker, Jack Greene, Tex Ritter, Dottie West, Bobby Bare, Sonny James, Loretta Lynn, Jeannie Seely, Connie Smith, Bill Anderson, the Browns, the Glaser Brothers, Willie Nelson, and Dolly Parton. During the ‘60s, country-themed television programs from the Opry stage became popular—in addition to the regular Opry broadcasts. Tragically, several beloved Opry performers died during this decade, including Patsy Cline, Jim Reeves, Cowboy Copas, Hawkshaw Hawkins, Ira Louvin, and Texas Ruby. An even more bizarre event occurred a few years later, on January 20, 1973, when Jerry Lee Lewis—in his first and only Opry performance—shocked the audience with his rock’n’roll and his swearing (telling the crowd that he was a “rock-and-rollin’, country-and-western, rhythm-and-blues-singin’ motherf—–”). Lewis also ignored his allotted time limit and the need for commercial breaks by playing for 40 minutes straight. Johnny Cash and June Carter perform “Jackson” on the Opry stage in 1968. In 1969, WSM President Irving Waugh revealed plans to build an amusement park called Opryland, USA, to be located about 20 minutes northeast of downtown Nashville. The park opened in 1972, featuring a variety of musical acts as well as roller coasters and other rides. The Opry moved to its large, newly built home, the 4,400-seat Grand Ole Opry House, in March 1974. The new Opry House was situated adjacent to Opryland. A farewell show was broadcast from the Ryman on Friday night, March 15, 1974. The first show from the new Opry stage took place on March 16, 1974. President Richard M. Nixon helped inaugurate the new venue by joining Roy Acuff on stage to play yo-yo. The beleaguered president, who at that time was struggling with the Watergate scandal, also played his own rendition of “God Bless America” on piano. At the center of the stage in the new building was placed a six-foot-diameter circle of oak-wood floor cut from the center of the Ryman’s stage. Thus, performers today stand on the same hallowed ground on which once stood Hank Williams and other country-music giants. Another change that the Opry had to deal with in the ‘70s was the rise of the Outlaw Movement, represented by such rugged individualists as Willie Nelson, Waylon Jennings, and David Allen Coe. These performers, with their hard-edged music and often wild lifestyles, mostly rejected the conservative Nashville music establishment, which was represented by the Opry. Jennings humorously dismissed the Opry as the “Grand Ole Uproar,” and he never had any desire to become a member. Many other big-name artists also had no interest in playing the Opry, because it interfered with their busy—and much more lucrative—touring schedule. For many country-music fans during this period, the Opry was regarded as an out-of-date vestige of the past—a place where only old-timers and has-beens played. Nevertheless, many singers continued to value the importance of the Opry. Singers who became Opry members in the ‘70s included Tammy Wynette, Barbara Mandrell, Tom T. Hall, Don Williams, Ronnie Milsap, and Larry Gatlin and the Gatlin Brothers. Ralph Emory introduces Ronnie Milsap at the Grand Ole Opry in 1976. In addition to boosting the careers of numerous musicians through the Opry broadcasts, WSM has also helped others on their roads to success. For example, Pat Sajak, the well-known host of Wheel of Fortuneon television, worked as the afternoon personality at the station in the mid-‘70s. He also worked as a voice-over announcer and weekend weatherman on WSM-TV. The significance and relevance of the Opry began to be restored in the 1980s as the Outlaw Movement started to fade and as singers with a more conventional sound came to the fore of country music. Some artists who debuted on the Opry stage during this time were Reba McEntire, Patty Loveless, Ricky Van Shelton, John Conlee, Mel McDaniel, Randy Travis, and Ricky Skaggs. A half-hour segment of a show from the Grand Ole Opry in 1987, featuring Tom T. Hall, Billy Walker, Wilma Lee Cooper, and Randy Travis. Despite being best known for the Opry since its founding in the 1920s, WSM had always featured a mix of different kinds of programming. That changed in 1980, when the station began airing country music on a full-time basis. In the early ‘80s, some of National Life’s properties were sold. These included WSM, Opryland, the Ryman Auditorium, and the Grand Ole Opry. The buyer was a friend of Minnie Pearl named Ed Gaylord, a business executive from Oklahoma. Gaylord also started The Nashville Network (TNN), which began broadcasting Opry shows on television in 1983. The Opry was later seen on the TV networks CMT and GAC. In 1997, Gaylord demolished Opryland and replaced it with a shopping mall and a resort and convention center. In 2012, Gaylord Entertainment was purchased by Marriot International, and its name was changed to Ryman Hospitality Properties. A division of that company called Opry Entertainment Group owns and operates the Opry today. The recruiting of more young “neo-traditionalists” and other contemporary hit makers to the Opry continued in the 1990s. Such artists included Clint Black, Alan Jackson, Garth Brooks, Trisha Yearwood, Martina McBride, Vince Gill, Marty Stuart, Travis Tritt, and Alison Krauss. Garth Brooks said, “To be recognized as a member [of the Opry] is among the class of honors that will never be topped, no matter how long or how far my career goes.” Such sentiments represented a stark change in attitude from the top stars of the Outlaw era. Also in the ‘90s, a few veterans joined the ranks of the Opry for the first time. These included Emmylou Harris, Johnny Paycheck, Charley Pride, and Bashful Brother Oswald. Roy Acuff and Vince Gill introduce Emmylou Harris on the Opry stage in 1992. During the late 1990s and early 2000s, the Opry began to reach more listeners through such modern technologies as SiriusXM Satellite Radio (on Willie’s Roadhouse, channel 59), smartphone apps, and websites (opry.com, wsmonline.com). New Opry members during the first decade of the 21st century included Brad Paisley, Carrie Underwood, Trace Adkins, Dierks Bentley, Montgomery Gentry, Josh Turner, and Pam Tillis, as well as the great Mel Tillis and Ralph Stanley. A somewhat surprising addition to the Opry cast during this time was Charlie Daniels, one of the founders of the Southern Rock sound of the ‘70s. Some of the newer Opry members—most notably Stuart and Paisley—have demonstrated a deep appreciation and understanding of country music’s history. For example, Paisley has often included Little Jimmy Dickens and other Opry greats on his albums and in his videos. The Opry House had to undergo major renovations in 2010 as a result of severe damage caused by a city-wide flood in May of that year. During the renovations, the show was temporarily staged in the Ryman and War Memorial auditoriums and other venues. The renovated Opry House re-opened for business in September 2010. But from November to January every year, since 1999, the Opry returns to the Ryman, which was renovated in the 1990s. These “Opry at the Ryman” specials serve to pay homage to the revered history of the Opry. In addition, the smaller venue of the Ryman is more appropriate for the downturn in tourism that occurs during winter. Artists who have been inducted into the Opry cast since 2010 include Keith Urban, Blake Shelton, Darius Rucker, Rascal Flatts, and Little Big Town, as well as the veteran country/gospel group, the Oak Ridge Boys. As of 2018, more than 200 individuals have been members of the Opry during its long history. Carrie Underwood sings “Dirty Laundry” at the Opry in 2016. Today, country-music fans can hear the Opry for at least two hours and fifteen minutes on every Friday and Saturday night (and on other nights during part of the year). Listeners can enjoy a mix of music from country veterans and newer acts. Occasionally, other types of performers have also appeared on the Opry stage, such as pop stars Stevie Wonder and James Brown, comedian Jack Black, and actors Kevin Costner and Robert Duvall. The Opry has evolved greatly from its small conservative Southern appeal into a broad-based institution appreciated by millions of people throughout the United States and around the world. In addition, the Opry’s national profile has been raised by the television series Nashville, which ran from 2012 to 2018. And the 2015 movie American Saturday Night: Live From the Grand Ole Opry showcased Opry performances as well as backstage scenes. The Grand Ole Opry House was added to the National Register of Historic Places in 2015. During the Opry’s 90th anniversary in 2015, Steve Buchanan, then the president of Opry Entertainment Group and the executive producer of Nashville, noted that the Opry was “at one of the healthiest points in our history. Opry fans and performers look forward to the institution’s 100th anniversary in 2025. Willie Nelson and Porter Wagoner perform a chaotic—but fun—duet on “Good Hearted Woman” at the Grand Ole Opry in the early 2000s. At its best, the Opry is all about having fun. The exhibits you’ll see at the Willie Nelson and Friends Museum honor many of the great Grand Ole Opry stars – past and present!